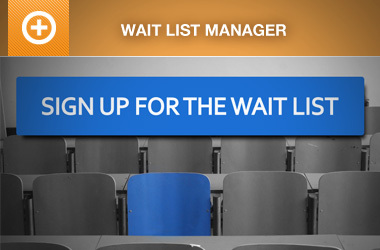 We have a site wherethe waiting list add-on is really needed but I have a few questions? 1. When someone goes onto a waitng list is it possible to get them to fill out the same form as registrants do as oppsose to just their email and name? 2. If they only fill out their name and email address on teh waiting list and we change their status to pending payment, how do we get them to fill out the real registrstion form as a name and email address is not enough for us to determine if they can actually attend the event they are registering for? When someone goes onto a waitng list is it possible to get them to fill out the same form as registrants do as oppsose to just their email and name? The Wait List is not intended to capture all registration information, instead it’s intended to capture basic contact information so in the event a space opens up, they’ll get an email where they’ll have the opportunity to register for the event. If they only fill out their name and email address on teh waiting list and we change their status to pending payment, how do we get them to fill out the real registrstion form as a name and email address is not enough for us to determine if they can actually attend the event they are registering for? ok thanks. We are no deciding what we want to do. The support post ‘Waiting List’ is closed to new replies.